Last week it finally happened: Twitter launched its own music service in Twitter #music. This is “a new service that will change the way people find music, based on Twitter.” Like so many other music and content-oriented services out there, Twitter is trying to crack the holy grail that is ‘discovery’. It knows what’s popular – Since Twitter’s acquisition of music service We Are Hunted, which specialised in analysing the likes of Twitter and making recommendations accordingly, the question has been how Twitter would encourage its users to discover music. An obvious first angle is to highlight music that’s popular, showing “new music trending on Twitter” (see Fig. 1 below). The tracks on here are irrespective of a user’s taste or the artists you’re following on Twitter. It can point you in the direction of new talent – I’d love to find out more how Twitter’s algorithm compile the artists and bands that appear in its “Hidden talent found in the Tweets” screen (see Fig. 2 below). Twitter suggests over a 100 artists who are considered “emerging”. Because Twitter Music primarily focuses on the artist, it will let users discover new music through the artist. For instance, when I click through on The Blank Tapes, one of the emerging talents mentioned, I get a neat overview of all the artists that The Blank Tapes follow (see Fig. 3 below). It’s dynamic! – The dynamic nature of Twitter is probably best symbolised by Twitter Music’s #nowplaying view which displays those tracks tweeted by the people that you follow. The tracks that appear on this screen are likely to change in rapid succession (obviously dependent on the number and kinds of people you follow and their Twitter activity). 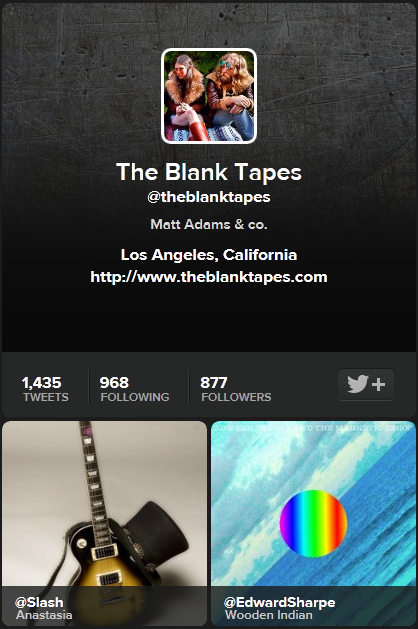 It’s cross-platform – Users can currently access Twitter #music via the web and iOS. An Android version is set to follow soon, with Twitter also looking to expand the service beyond the US, UK, Canada, Ireland, New Zealand and Australia. One can imagine a tablet version to also be introduced soon. Apart from being cross-platform (which was to be expected), Twitter Music offers a tight integration with iTunes, Rdio and Spotify. By default, you users can listen to track snippets through iTunes and will have to log into to Rdio or Spotify account to listen to the full-length track. Twitter is thus creating its own – fairly closed – ecosystem around music and music discovery. Main learning point: in a way, with “Twitter #music”, Twitter has launched a music service that very much does what you’d expect it to do. With the amount of ‘social data’ that Twitter has of its users and the activity on their platform, you’d expect nothing short of a highly usable and ‘intelligent’ music service. Twitter #music definitely delivers on those fronts: it provides a good user experience, it’s visually appealing and – most importantly – it does stimulate users to discover new music. However, Twitter’s new music service still feels fairly one dimensional. Opportunities to actively engage with artists are limited and ways to find out about more things than just their music (e.g. live dates, discographies) are non-existent. It would be great to see Twitter build on its music service by adding more ‘interaction’ over the next few months.